Worms and allergies: A smoking gun? These observations . . . could be explained if allergic diseases were prevented by infection in early childhood, transmitted by unhygienic contact with older siblings, or acquired prenatally . . . Over the past century declining family size, improved household amenities and higher standards of personal cleanliness have reduced opportunities for cross-infection in young families. This may have resulted in more widespread clinical expression of atopic disease. In the nearly 20 years since, this hypothesis hasn’t been proved or disproved. There are quite a few interesting correlations, and the underlying biology seems to make a lot of sense, but as least as far as I know there’s been no smoking-gun study that makes an undisputable link. A Nature Medicine paper2 from a couple of weeks ago adds a little more support to the hypothesis, and this one also holds out a distant hope of some kind of intervention as well. 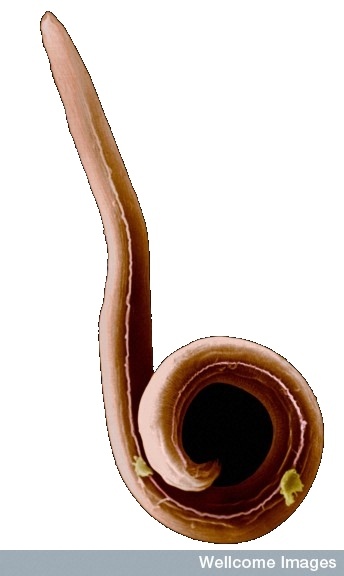 It’s long been known that parasitic worms — now rare in the West, but until recently a normal part of the human condition — induce an immune response that is broadly similar to a lot of allergic responses. Suppression of mast-cell function by ES-62 offers a new explanation for the reason why people harboring worms of at least the filarial nematode type show reduced incidence of allergy, in spite of their elevated serum IgE. … By inhibiting mast-cell effector function, ES-62 offers a new potential therapeutic approach for diseases such as asthma, a medical problem of enormous importance in the developed world. Although ES-62 per se is unlikely to be used for treatment, enough is known about its structure and function to allow one to envisage the development of small, presumably phosphorylcholine-based, derivatives as drugs. This entry is filed under Allergy, Immune evasion, Parasites, Science. You can follow any responses to this entry through the RSS 2.0 feed. Both comments and pings are currently closed. Could cleaner households have reduced the effectiveness of the immune system? I read the antibacterial soap has had such an effect. The body has less of a need to fight bacteria and thus becomes less adept at doing so. I wonder if better sanitation in households has done the same thing. After, looking at history, native Americans were less resistant to European diseases as they didn’t evolve in cities with widespread pollution. Thus, their immune systems hadn’t adpated. I’m not an expert in parasitic or rare diseases, but I remember seeing enlarged images of microscopic creatures that exist on our body. Among them are the worms that are in our intestine and throughout our skin/hair. We’re literal petri dishes! It’s very difficult probably to know exactly what has caused an uptick in allergies, but I think I agree with this hypothesis – There simply has to be a reason, and it’s a very valid explanation for the anomalous changes. I have heard about this theory a long time ago and it made perfect sense to me. As a child I used to get sick all the time, but as I grew I became very resistant to common sicknesses… Nowadays, everyone around me is allergic to something, food, pollen, animals … Indeed it seems things are getting worse. There are allergy shots for being allergic to enviroment that slowly gets one get immuned to what they are allergic to. There aren’t any for foods however, for the way allergies work, when the enviroment allergies go down the foods do also. Its helped me so much being allergic to celery, soy, and mangos- being allergic is still a problem, but not a deathly risk as much as before. Very interesting article , I think this is an effect of living in a very sterile environment like most of us do nowadays. We lose immunity against conditions that our past generations have. This could be an accidental ( or maybe not ) case of symbiosis , we provide a home for these worms and in turn they protect us from allergies by the toxins we secrete. Maybe in our quest of achieving a germ/virus/micro organism free society we have weakened our immune system that has acquired it’s strength from generations of exposure and evolution. Hmm, what does this say however about the growing increase in allergies and asthma diagnososis? I feel like it would be a negative correlation not a positive one if worms were involved. interesting article. and i agree with Dino. It is an effect of living in a very sterile environment like most of us do nowadays. We lose immunity against conditions that our past generations have. Which is in one way good. Very nice article! Very imperssing! Many moms commit this mistake with their young children. This is a really interesting post about a parasite’s ability to contribute to a human’s immune system. If this research will be further proven correct, then I guess these worms shouldn’t be called “parasites” anymore. I have a friend who is so allergic to fish etc she swells up after being in the ocean, and she completely blames her mother for coddling her as a child and never letting her be exposed to anything to build antibodies. I have to agree. I have been asthmatic for the past 18 years, and I didn’t think a parasite could’ve caused it. I think it was more likely cause by the weakening of my immune system after I had amoeba when I was a baby. As for the recent ‘breakout’ of allergies, I hope the doctors would be able to find the cure very soon.